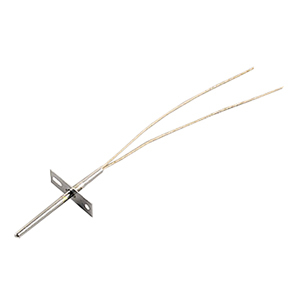 These Precision RTD Temperature Sensors, specialized for laboratory and industrial environments, features a 316 stainless steel tube housing ideal for air, gas and liquid immersion applications. The flanged style design has a stainless steel bracket welded onto the probe, providing an easy means for mounting and installation. Standard units use a 100 Ohm Platinum RTD Sensor. Options for 500 and 1000 ohm elements are available. 참고: The “A” dimension can be immersed in liquid up to mounting flange. Standard elements are 100 Ohms at 0°C, for 500 Ohms or 1000 Ohms , add suffix “-500” or “-1000” and add $5 to price. For leads with Molex Pin 03-06-2023 and male Molex 02-06-2101, add “-MOLEX” to Model No. and $4 to price. Other connectors available.